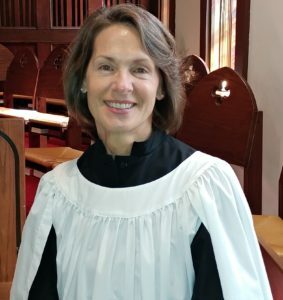 There are more new choir robes to be filled! The Grace handbells of St. Paul’s are ringing each Sunday during Lent in the 10:45 service. If you have not heard the bells, I encourage you to attend and witness firsthand the beautiful addition they make to our music program. Our handbell choir meets faithfully each Wednesday at 4:30 in the choir room to rehearse, laugh, and have fellowship with each other. Sarah Jo Safrit,, Ashley Henry, Len Gilstrap, Diane Meelheim, Barb Ackermann, Sandra Howarth, and Anna deButts (not shown). The handbell choir, the children and the adult choirs are preparing glorious music for our various Easter services – complete with plenty of ‘alleluias’ – we cannot wait to share it with you! 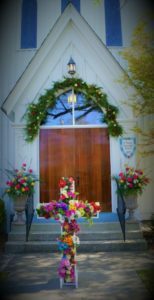 The 6:00am Easter Vigil will offer ancient chant as we proceed from darkness into the first light of the resurrection, followed by lessons with canticles and hymns in the sanctuary. The 9am Eucharist will offer Rite II liturgy with the children and the adult choirs. The 11:15 service will offer Rite I liturgy with the adult choir and the handbells. Please don’t feel like you can/should only attend one service. Since each one is a little different the opportunities to offer praises to God the Father, Son and Holy Spirit will abound. I want to thank Nancy Smith and Vicki Morris for their help with cleaning and mending the children’s blue choir gowns in preparation for Easter Sunday. Our children’s choir will look every bit as good as they sound. 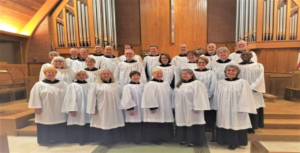 One final reminder, mark your calendars for Sunday, May 5 at 5pm for Choral Evensong by Schola Cantorum of the Diocese of East Carolina with guest organist Christopher Pharo. 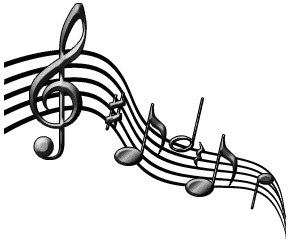 A reception will follow in the Parish Hall to meet and greet the musicians. 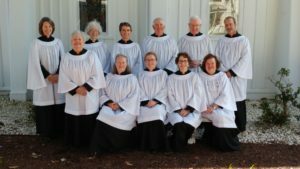 The mission of Schola Cantorum is to keep alive the art of the fully-sung evening prayer service. All are invited to experience and appreciate this rich worship tradition.